A dolphin at Monkey Mia in WA. It isn’t every day that you get a chance to swim with a mammal that’s far smarter than you are, learned to surf way before you did, manages on less sleep than you do and can jump higher out of the water than you can. Amazingly, these remarkably able beings are prepared – without much encouragement – to spend some time playing with much less talented beings: we humans. They do this in a variety of places around Australia. 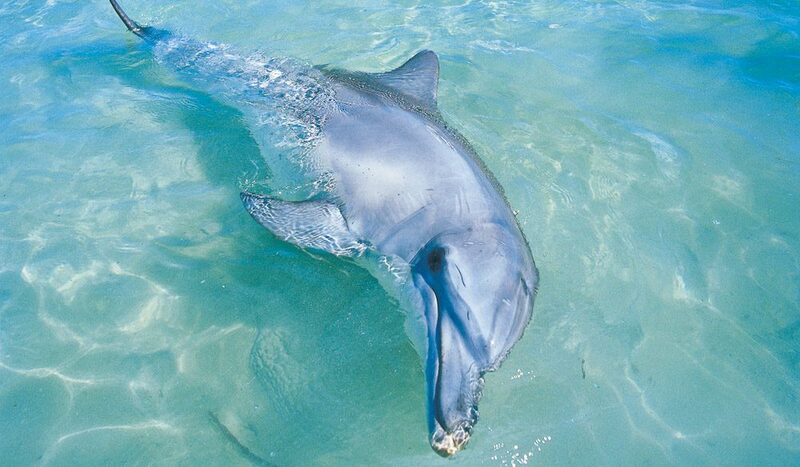 WA’s Monkey Mia is probably the most famous (completely wild, no feeding), but it’s possible to swim with dolphins in many other places as well these days. It’s a magical and unforgettable experience – being smart, they sure know how to get humans to love them. Dolphins have excellent eyesight, but they can only see in front of and below them, so they sometimes need to swim upside-down to catch fish. Show-offs. Qantas and Virgin Blue offer daily flights to Perth from all major cities in Australia. Shark Bay, where Monkey Mia Dolphin Resort is located, is an eight to 10-hour drive (850km) from Perth along a sealed road. Greyhound has regular bus services to Shark Bay. Skywest Airlines operate direct flights from Perth to Shark Bay airport. Anytime – Shark Bay has an average of 320 days of sunshine a year.